The regional final of Ireland’s Best Young Entrepreneur Awards competition took place in the Clayton Hotel last week. County winners from Galway, Mayo and Roscommon pitched their new, start-up and established business ideas to judges, with the winners announced at the end of the pitching day. Regional Winner of Best Start-Up was Mayo contestant John McNicholas for his company Inspire Tile and Stone which specialise in the supply and installation of tile solutions. 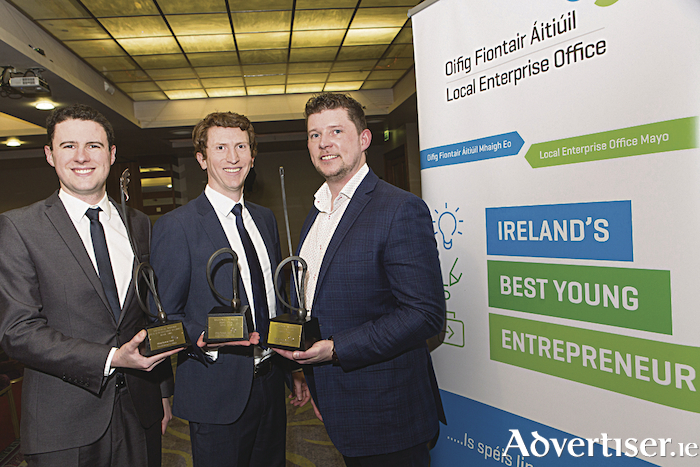 Winner of Best Established Business Idea was Mayo contestant Daniel Loftus for his company UrbanFox which specialise in the development of anti-fraud technology. Breda Fox, CEO of Local Enterprise Office Galway praised the exceptional high standard of entries in 2018. “This was an exciting and highly competitive event for Galway’s aspiring and existing entrepreneurs, with finalists spanning various industries and experience levels. The standard of entries was exceptionally high and the competition provides vital recognition for innovative businesses and business ideas. We encourage all participants and future participants to avail of the supports offered by LEO Galway as they continue in their entrepreneurial endeavours’.